1Shake all ingredients for 20 seconds with ice cubes in a cocktail shaker. 2Pour into a chilled cocktail glass. 3Twist an orange rind over the cocktail to release the oils. 4Garnish with cocktail cherry and orange twist. 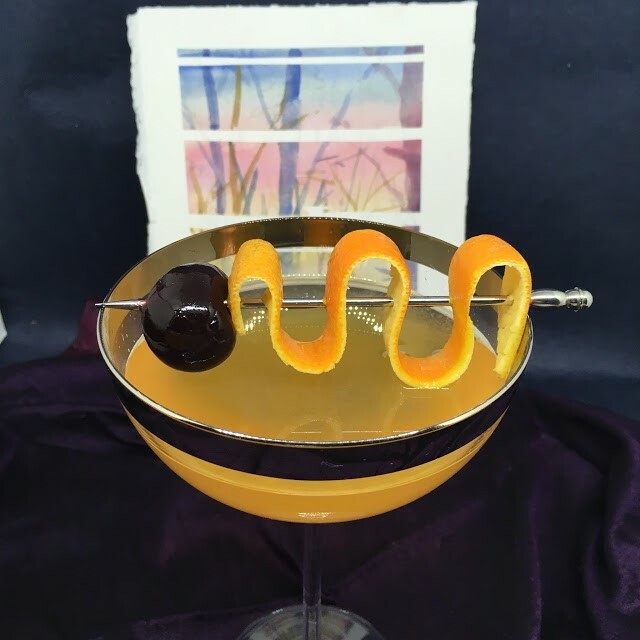 Here's another beautiful cocktail, and artwork, from our friends who manage The Cocktail Artist blog. We met them at a Virginia Spirits event in Washington, DC. Inspired by the classic cocktail, the Amaretto Sour, they crafted their version - with a little less "sweet" to it. This one is uses our Lemon Zest-infused syrup. Enjoy their gorgeous paintings while you sip on this one!